Ernest Hemingway, Tennessee Williams and numerous presidents have made Key West their Floridian island of choice over the years and if you're following in their footsteps then you won't be alone, especially during the festival season and spring break. The Old Town is always popular with the likes of Duval Street and Mallory Square presenting all manner of people-watching potential with cafes, bars and restaurants opening 'til the wee small hours. From Victorian architecture and Civil War forts to art museums and Hemingway's house, there are a whole host of reasons why visitors make the pilgrimage south to Key West however, no sooner have you clapped eyes on the beaches at sun set then you'll know why they stay. Palm trees, pearl white sand and infinite cobalt blue water that forms a seamless transition with the sky, if you want to discover the beaches of Key West and where to stay on the island then read on and don't forget to savour those screen saver sun sets. 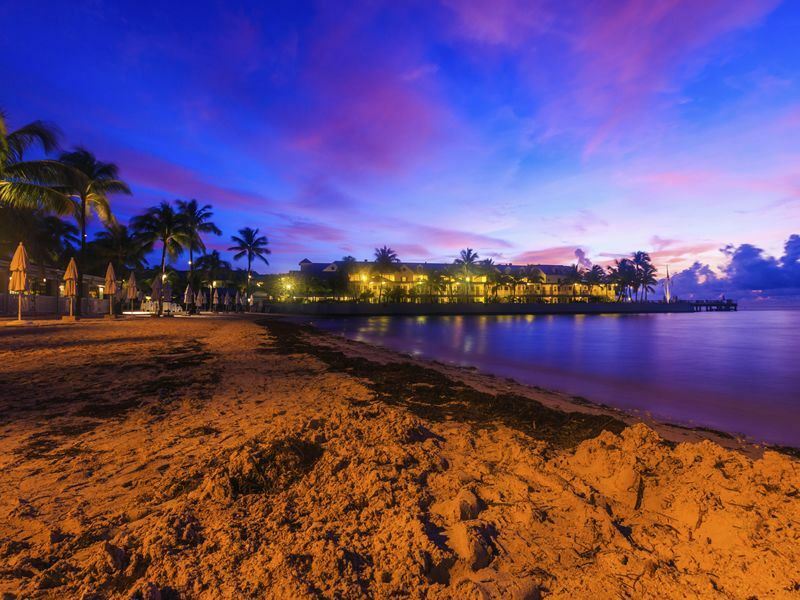 As the largest of all Key West's public beaches, Smathers is about a half mile in length and popular with sun set strollers and day trippers looking to enjoy the Atlantic waves from the shade of a coconut tree. Situated on the island's south side and featuring plenty of rentable kayaks, boats and deck chairs, Smathers is certainly worth checking out and perfect if you're up for a game of volleyball against a tropical back drop. Although not strictly located on Key West island, Dry Tortugas National Park is definitely unmissable if you're in the area as it boasts some of the best dive spots in the whole of Florida. Tropical fish, ship wrecks and twinkling coral reefs are all to be found beneath the turquoise hues of the Gulf of Mexico and making the 70 mile trip by seaplane or boat is certainly worthwhile if you're looking for beach action. From the imposing Fort Jefferson, made with over 15 million bricks, to almost 300 different species of bird, Dry Tortugas National Park is a nature lovers paradise with a bounty of beautiful beaches to boot. Stroll down to the most southerly tip of Key West and you'll find not only the US National Historic Landmark, Fort Zachary Taylor, but also one of the island's best-loved beaches which promises some fabulous spots to picnic or bbq within over 50 acres of land. This is an ideal stretch of shoreline for snorkelling, swimming, jetty fishing, cycling and getting involved with Civil War activities associated with Fort Zachary T.
Boasting America's only beach accessible marine park as well a botanical garden in the grounds of West Martello Towers (Civil War era fort), Higgs Beach is located on the southeast shores of Key West and definitely worth a visit, if only for the peace and tranquility of the gardens. The beach itself is fairly small but well-kept and ideal for snorkelling and swimming before making the most of the local cafe's Caribbean/Italian fare. A fairly narrow stretch of sand featuring an unproportionally large pier which is ideal for fishing and yoga practice at sun down. Located next to Higgs Beach, on the southeast side of Key West, this is an excellent beach for strolling and favoured by dog-walkers however, probably not recommended if you're looking for group activities such as beach footy or volleyball. Get the VIP treatment with your very own private beach which is over 1,000ft in length and perfect for catching some rays and making the most of the ocean waves. If that wasn't enough the Casa Marina, which is located on Reynolds St a short walk from Duvall St, also has a couple of swimming pools, a gym, tennis courts, restaurants and a bar with Wi-Fi options if you want to make the folks back home green with envy. Thanks to the hotel's free shuttle bus service day trips, to: the beach, Old Town district and Key West marinas, are all available whilst staying at the DoubleTree and if you're into golf then there's an awesome course located nearby. If you fancy staying put then you'll find a pool, fitness suite, restaurants and bar to keep you off the streets. With an enviable location, overlooking Mallory Square at the end of Duval St, Ocean Key Resort is an amazing place to stay whilst in Key West and a must if you want to place yourself at the heart of the action. The resort's Sunset Pier is one of the best places on the whole of the Keys to enjoy seafood as the sun sets however, as you'll also find swimming pools, spa services and further restaurant facilities on-site there's more than one way to skin a cat on a hot tin roof.